Limited-edition heart-shaped packaging breaks apart so you can give the gift of an unbeatable bounce to your bestie. With two original beautyblender makeup sponges and blender cleanser samples, this set is the key to show your bestie to never settle for less than the ultimate in flawless makeup application. With the soft, exclusive material from beautyblender, your friend will be hooked from the first bounce. 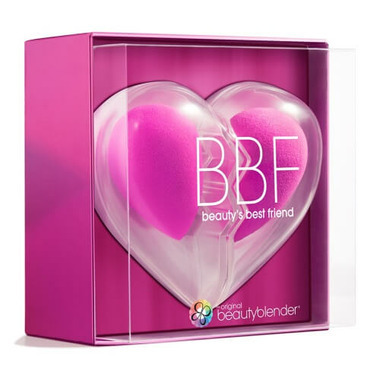 Like your friendship, the beautyblender quality cannot be duplicated, so, you both will be putting your best face forward. Usage: Simply wet.squeeze.bounce. your way to makeup perfection! wet. beautyblender with water squeeze. out the excess liquid, using a towel if available. bounce. concealer, primer, foundation, powder, cream blush or any other complexion product across the face for flawless results.